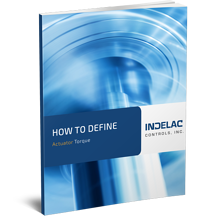 3 Ways to Define Actuator Torque | Indelac Controls, Inc. Lack of knowledge about torque can often mislead buyers to inaccurate choices when choosing an actuator for their automation package. Our guide, 3 Ways to Define Actuator Torque in Words You Understand, provides clear definitions of what actuator torque is; highlighting torque, force, and distance. Simply fill out the form to the left to download your free guide.